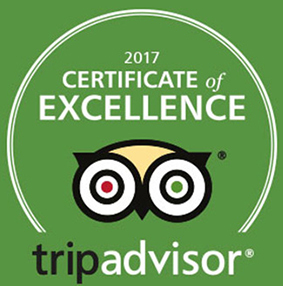 / Best Award Winning BBQ Destin FL / Landshark’s Chow & Cheer ALABAMA CRIMSON TIDE vs KENTUCKY WILDCATS & TONS More for NBA ALL-STAR SATURDAY! 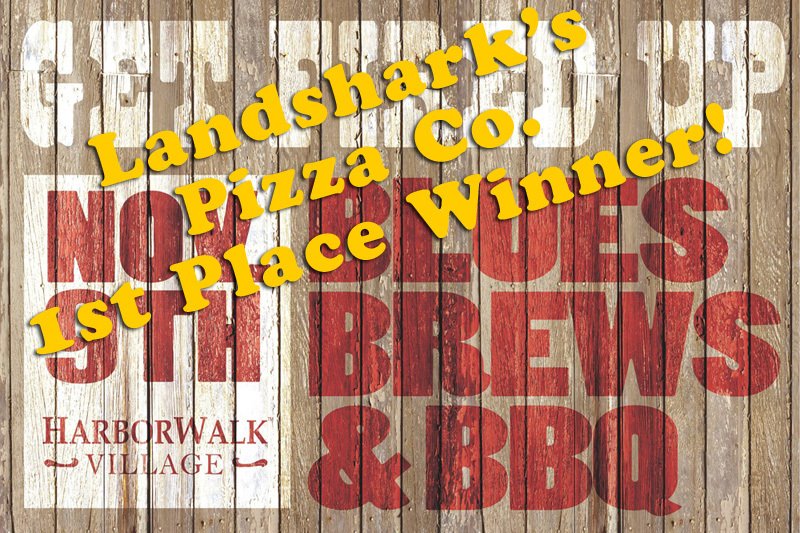 Landshark’s Chow & Cheer ALABAMA CRIMSON TIDE vs KENTUCKY WILDCATS & TONS More for NBA ALL-STAR SATURDAY! Okay, now that everybody’s starting to SWEAT AGAIN, let’s exercise ourselves into spring shape by jumping around yelling for some DEE-FENCE while stuffing ourselves with wings, pizza, subs, appetizers, cocktails – and that’s just the first course! 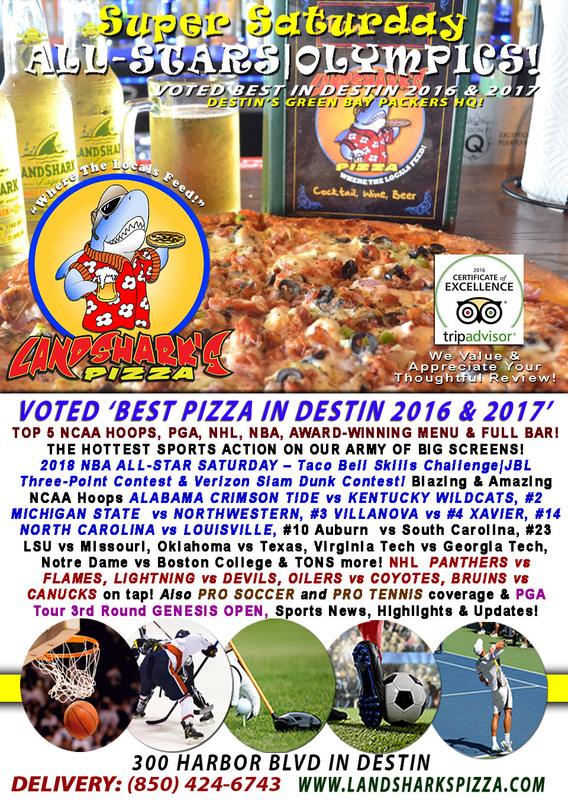 Come on in to cheer and chow down at Landshark’s with top-ranked College Hoops all day in Destin along with NHL, PGA, NBA All-Stars and more! 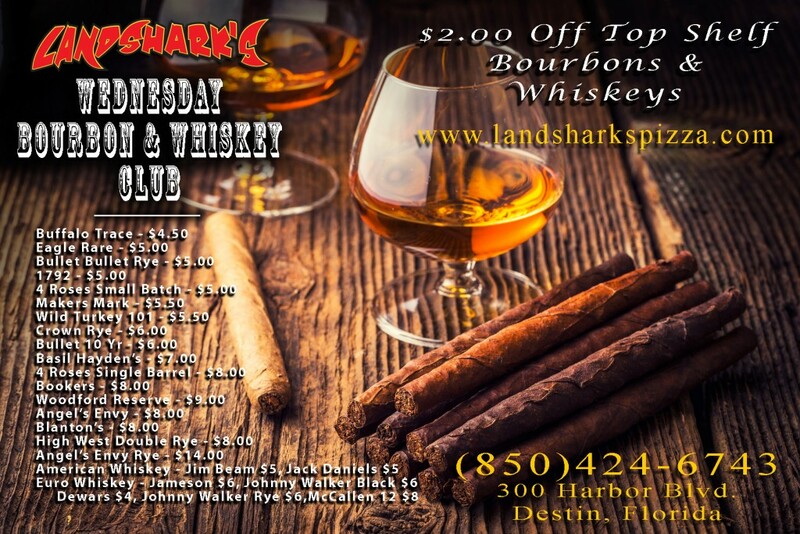 LANDSHARK’S DRINK O’ DA DAY – DON’T SIP, EAT YOUR COCKTAIL! 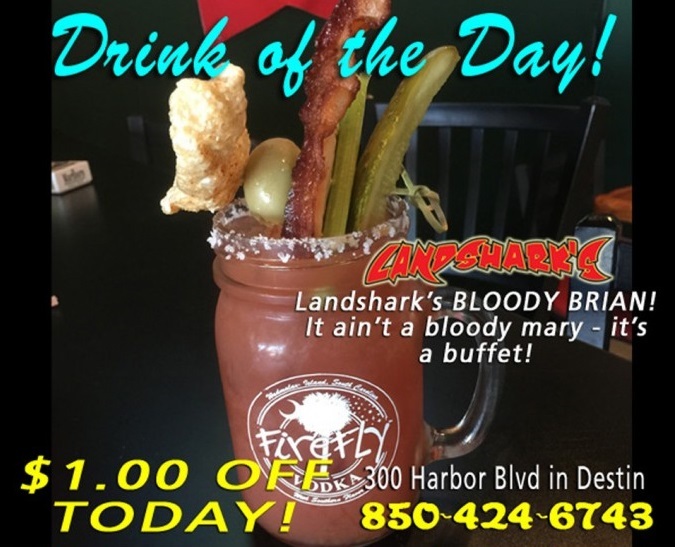 Enjoy the ‘Feast In A Glass’ – A delicious ‘BLOODY BRIAN’ for a Buck Off! So BUCK OFF! SPORTS ON OUR ARMY OF BIG SCREENS – 2018 NBA ALL-STAR SATURDAY – Taco Bell Skills Challenge|JBL Three-Point Contest & Verizon Slam Dunk Contest! 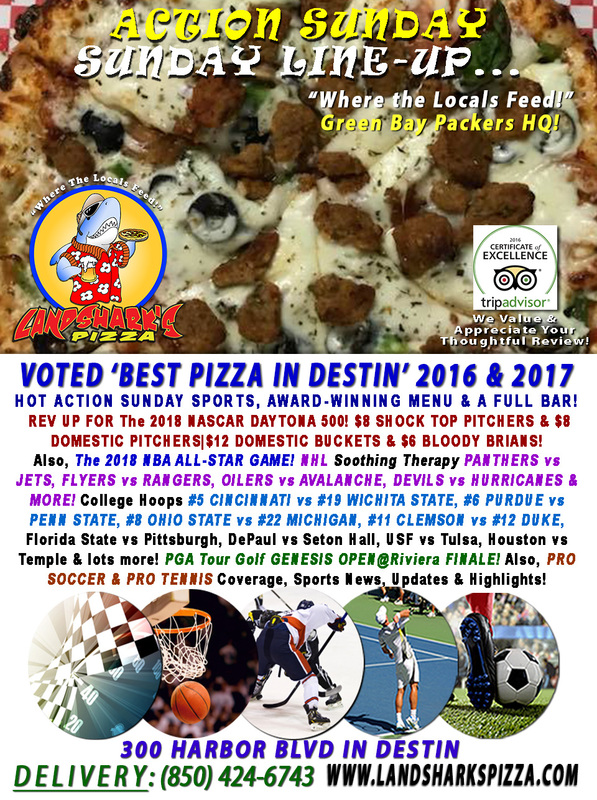 Blazing & Amazing COLLEGE B-BALL with ALABAMA CRIMSON TIDE vs KENTUCKY WILDCATS, #2 MICHIGAN STATE vs NORTHWESTERN, #3 VILLANOVA vs #4 XAVIER, #14 NORTH CAROLINA vs LOUISVILLE, #10 Auburn vs South Carolina, #23 LSU vs Missouri, Oklahoma vs Texas, Virginia Tech vs Georgia Tech, Notre Dame vs Boston College & TONS more! NHL Hockey buffet PANTHERS vs FLAMES, LIGHTNING vs DEVILS, OILERS vs COYOTES, BRUINS vs CANUCKS, Capitals vs Blackhawks, Canadiens vs Golden Knights, Ducks vs Wild, Kings vs Sabres & more. PGA Tour 3rd Round Genesis Open@Riviera Country Club! Also, PRO SOCCER and PRO TENNIS coverage plus plenty of other Sports Broadcasts, Sporting News, Analysis, and Commentary! NBA This Weekend: (Sunday) NBA G League International Challenge & 67th NBA All-Star Game! 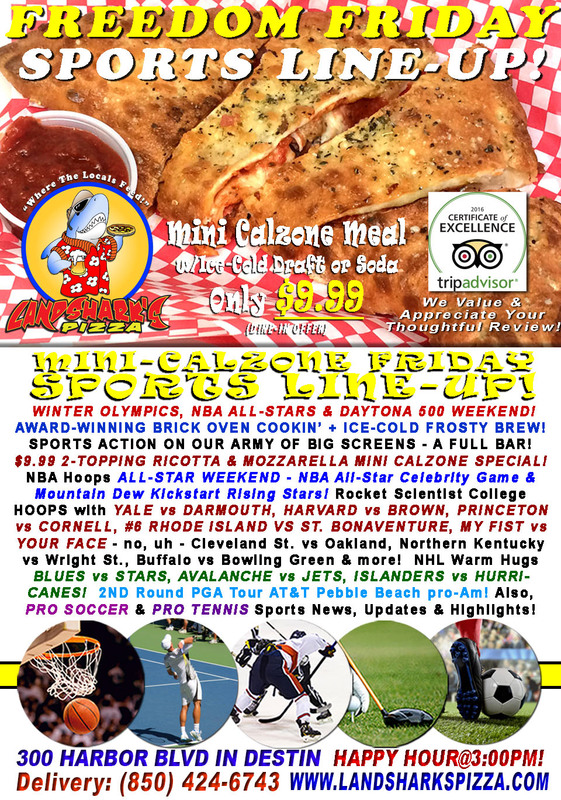 Previous Post: « NBA ALL-STAR & WINTER OLYMPICS FREEDOM FRIDAY TWO-TOPPING CALZONE & Brew $9.99 – NCAA|NHL & PGA!